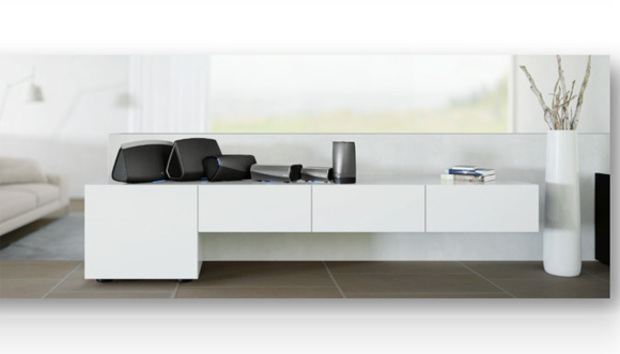 Denon announced today a major expansion of its HEOS wireless multi-room audio system (the acronym stands for Home Entertainment Operating System). But in a press release filled with new features you won’t find in Denon’s current HEOS lineup, the company fails to mention a number crucial of details, including descriptions of specific products; when they’ll be available for purchase; or even the names of the new products. The big news is that components based on the new HEOS HS2 (HEOS System 2) platform will have more-powerful processors (an ARM A9 processor running at 1.25GHz), which will enable them to decode uncompressed WAV (PCM), ALAC, and FLAC files with up to 24-bit resolution and sampling rates as high as 192kHz. And where buyers of the original HEOS line needed to purchase dongle in order to stream music via Bluetooth, HEOS HS2 products will have built-in Bluetooth radios. If you stream music to one HEOS component, you’ll be able to stream that music to other HEOS speakers on your Wi-Fi network. Alternatively, you can stream different tunes to each network node. HS2 components will also gain the ability to decode DSD files down the road, but a company spokesperson declined to provide a target date for that (DSD is the file format developed for the SACD—Super Audio CD—platform). There will be no way to upgrade first-generation HEOS products to enable them to decode the higher-resolution audio formats that HS2 products can, but those older devices will be able to join a group in which the leader is playing high-res audio. Presumably, the HS1 components will down-sample the high-resolution bit stream into a format that they can handle. The HEOS app—available for Android, iOS, and Amazon Fire devices—can link to a broad range of music-streaming services, including Spotify, Pandora, Amazon Music, and Tidal. Users can also stream music stored on their smart devices, personal computers, or a NAS box. Why this matters: While Denon’s announcement lacks key details—it’s perplexing to hear of a whole new product line without mention of a single model number, price tag, or ship date—the features Denon is claiming for its HEOS HS2 line are certainly impressive. As high as our opinion of Sonos—the 800-pound gorilla in this space—has long been, we’ve always dinged the company for its refusal to build hardware that can support the high-resolution file formats that Denon says its new products will be capable of handling. Sonos clearly thinks CD-quality music is good enough, and that the market is moving to streaming-music services anyway—a market where FLAC-streaming Tidal is a distinct outlier. In a recent blog post, Sonos CEO John MacFarlane said the company intends to continue to focus on streaming while placing an entirely new bet on voice control. In announcing HEOS HS2, Denon is somewhat bifurcating its multi-room audio system—it’s creating a new platform with capabilities its old one will never be able to match. We’re cautiously applauding this move for now. We’ll reserve our final judgement, of course, for when we get HEOS HS2 products that we can test. We will also continue to watch the legal drama between these two companies unfold. Sonos filed a patent-infringement lawsuit against Denon parent company D&M Holdings in 2014, and D&M counter-sued in 2015. It could be years before these claims and counterclaims are settled.